This map shows the projects that will be built under Measure M, including several in the next decade. You probably heard the announcement earlier this hour by Los Angeles Mayor Eric Garcetti: an agreement has been reached with the International Olympics Committee for our region to host the 2028 Summer Olympics and Paralympics, pending a vote by IOC members in Lima, Peru, in September. In terms of local transportation, a lot will change between now and 2028. That is thanks to Measure R and Measure M, the two transportation ballot measures approved by L.A. County voters in 2008 and ’16, respectively. Many Olympic events (here’s a map) will be clustered in a few areas around our region, with three major “sports parks” adjacent to rail or bus rapid transit lines in downtown Los Angeles, the Sepulveda Basin in the San Fernando Valley and the Long Beach waterfront. Other venues are also near transit (Santa Monica Beach, the Rose Bowl, the new football stadium in Inglewood, StubHub Center, to name a few) or will be served by shuttle buses from transit and other destinations. I’ll try to bring everyone up to speed quickly on the Metro end of things. •The 8.5-mile Crenshaw/LAX Line between the Expo Line and Green Line, which is scheduled to open in fall 2019. An additional station at Aviation Boulevard and 96th Street is scheduled to open in the early 2020s and will be the transfer point to the future LAX people mover serving the airport’s passenger terminals. The people mover will be built by Los Angeles World Airports. •The 3.9-mile first section of the Purple Line Extension from Wilshire/Western to Wilshire/La Cienega with stations at Wilshire/La Brea and Wilshire/Fairfax. A second section to downtown Beverly Hills and Century City and a third section to Westwood are scheduled to be completed in the mid-2020s. •The 1.9-mile Regional Connector that will connect the Blue, Expo and Gold Lines and is scheduled to open in late 2021. When done, Metro will run two light rail lines: one between Azusa and Long Beach and the other between East Los Angeles and Santa Monica. The two lines will be share five stations in DTLA. •An extension of the Gold Line from Azusa to Claremont with other stations in Glendora, San Dimas, La Verne and Pomona. With funding from San Bernardino County, the line could be extended to Montclair. •A bus rapid transit project on Vermont Avenue that will be adjacent to the L.A. Memorial Coliseum and Exposition Park. •A high-capacity transit line (either bus rapid transit, tram or light rail) that will run on Van Nuys Boulevard and San Fernando Road between the Orange Line and Sylmar/San Fernando Metrolink station. •The first phase of an Artesia-to-Union Station light rail line. •A bus rapid transit line between North Hollywood and Pasadena with connections to Burbank, Glendale and L.A.
•Upgrades to the Orange Line to improve bus speeds and travel times. Under the direction of the Metro Board (which includes Mayor Garcetti) and Metro CEO Phil Washington, the agency continues to look for ways to accelerate projects as long as other projects aren’t negatively impacted. The bottom line: with an expanding transit network and special bus shuttles, the 2028 Olympics and Paralympics will be pretty easy to enjoy without having to drive. The map link doesn’t work. Looks like they quickly replaced la24.org with la28.org. Has anyone with the airport informed Metro when they expect to construct the people mover and when it will be completed? So far, I see nothing being done and I have not heard anything more about that project. Apparently, there are seven construction projects planned at LAX, from the terminal and runway renovations to the people mover. LAWA must be working on phasing for all of that. Now that the pressure is off with the Olympics coming to LA in 2028 instead of 2024, it will be interesting to see if that will mean a longer timeline for the people mover. Maybe Steve can enlighten us on what the agreement is between LAWA and Metro re a completion date. Los Angeles World Airports has been saying they could finish the people mover by 2023. I haven’t yet heard how that might change with the Olympics getting pushed back four years. Obviously it gives them more leeway and it’s a very complicated project, given the confines of LAX (particularly in the horseshoe area). If I hear about updated timelines I’ll certainly report on the blog! Any plans to accelerate a sepulveda pass train? With the exception of the Purple Line extension to Westwood, I’m not impressed with LA’s transit planning for 2028. Here’s the most notable missing link: there is no north-south transit connection on the Westside between Westwood and LAX – even though the Olympic Village will be at UCLA and even though LAX, as you have noted, is spending billions on the people mover project. Phase 3 of the Sepulveda Pass transit project, which would provide the necessary transit connections, is not due to open until FY 2057, some 40 years from now and 3 decades after the 2028 Olympics will long be over. Another vital Westside transit link, along Lincoln Blvd. from LAX to Santa Monica, is not due to be completed until FY 2047, again 20 years too late for the Olympics. What gives ? The controversies over the road diets to major roadways on the Westside (Vista del Mar, Venice Blvd., Jefferson Blvd., Culver Blvds.) shows how inadequate are existing roadways are for existing highway traffic. Yet, for reasons that remain inexplicable to me, Metro has no plans to provide north-south transit alternatives to the impassable San Diego Freeway and adjacent streets for the next 3 decades. It may take an Olympian effort, but our transit planners need to take another look at what is most needed to make the 2028 Olympics a moveable feast. You bring up some great points about north/south movement on the westside. Traffic will stay horrendous until viable options exist on Lincoln and Sepulveda. 11 years is a long period of time. But, when you look at how long it’s taken to get the Purple Line extension and Regional Connector going, it may not be enough to get some of these projects done. It may be a few years before they figure whether Sepulveda will be heavy rail or something else. Metro could effectively go for some “small wins” in this time period — grade separation on Flower, Bypass track on Blue, Crenshaw north to Purple, Green to Norwalk Metrolink. And even if no extra projects are done by 2028, the Olympics are a two-week endeavor that can be managed with a rented fleet of buses with temporary bus priority lanes on major thoroughfares. Go back and listen to the press conference Monday and you’ll hear that Mayor Garcetti seems pretty determined to get some upgrades to the Blue Line done. I thought that was interesting. The South Bay/Stubhub complex will be poorly served by transit. The minimum number of passengers to be toll free on the Harbor Transitway will need to be raised to three or even four in 11 years, because the roadway is getting close to useless during the peak hour with the number of carpoolers, electric vehicles, and people pretending to carpool. The original Carson football stadium idea had a stub train off the Blue Line proposed to serve it, which isn’t going to happen, but a more robust connection to transit there is needed. May I suggest a redesign and improvement on the Blue line, to Long Beach. It is still takes me 2 plus hours to go from Downtown LA to East Broadway in Long Beach. Also consider improving the security or safety of the passengers during weekends and evenings. I might add, the exchange from green line to blue line, needs improvements for passengers with bags coming from the airport. Thank you. The map maker may want to redraw the routes in the future, to align the stops correctly. Vermont Ave should run straight from north to south, but the planned route along that street zigzags on the map between the Red, Expo, and Green lines. It also would make sense to show that the Crenshaw Line travels southwest for a while before reaching Aviation. 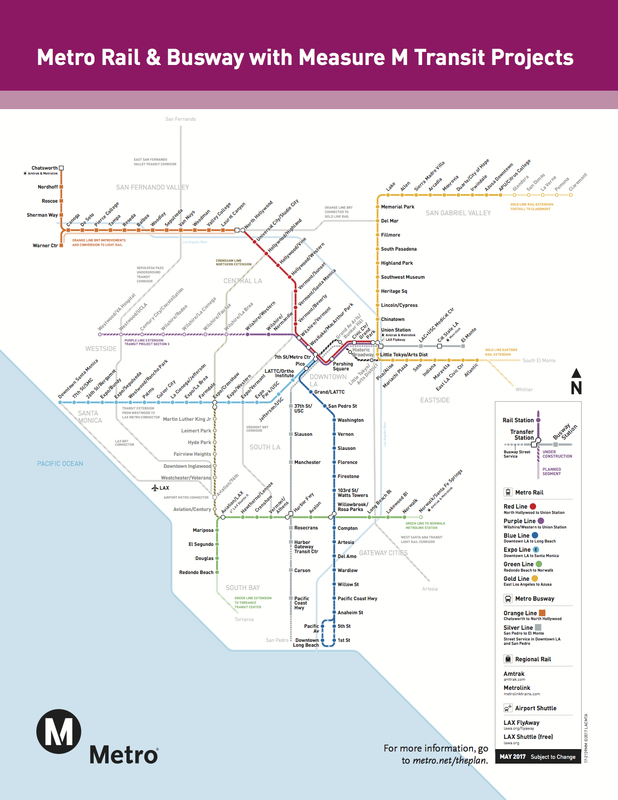 Frankly, the whole Metro rail/busway map is ugly, hard to read, and needs a complete redesign. I realize schematic maps may take some liberties as to the actual geography and spatial relationships, but this thing is a real dog, with way too much white space. Where’s the Blue Line express tracks, or wasn’t there going to be another Blue Line shifted slightly to the west? I thought I read that somewhere. So who is going to operate the Lincoln brt? The Lincoln BRT is a Metro project funded by Measure M. The project’s studies haven’t begun but hypothetically the bus lanes could be used by more than one agency, I suppose. I am hoping metro can operate a peak bus only express line between north hollywood station and Magic mountain. I am confident this line has great ridership potential. Metro can run 3 trips in the morning to the back and 3 trips in the evening back. We already have express line 460 to Knotts and Disneyland. Too many stops for the trains. Only the purple line does it right. For the 1984 Olympics, there were many traffic and congestion concerns. There was no mass congestion and traffic nightmares. In anticipation many companies altered their workweeks. At my firm we worked 4 days each week (10 hours), with Fridays off. Some companies closed for the two weeks (my mom used the time for vacation). Similar accommodations can be made, where organizations (with the capacity to do so) can allow workers the opportunity to work remotely. I look forward to a local Olympics in my hometown, with much better public transit than in 1984. Given the existence of Airbnb today, many Angelenos affected would do better to take their vacations over the Olympic events and let visitors pay to occupy their homes. Metro should consider putting everything rail on the above list into EIR and then see what they can get in acceleration funding from the feds. State funding from the carbon tax should maybe be available to start and over-staff the EIR process on all the rail projects, the extra staffing could result in an EIR process 20-30% faster. It’d be worth it to have options capable of breaking ground in 2020 or 2021. Additionally the state should look into expedidated EIR processes like Farmers Field had. Or at the very least the state could look into using the Farmers Field solution to immunize the EIR process for Los Angeles LRT and HRT from CEQA Green-mailing schemes, such as the successful Green-mail scheme over the recent factory to build train cars in Palmdale. What the olympics needs is a westside rail backbone (the sepulveda pass tunnels) to unify the olympic village, Valley and LAX. We should immediately eliminate car tunnels listed in the above as Phase 1–or any PPP that includes car tunnels–because EVERY comparable tolled car tunnel in the world that has ever been tried has gone bankrupt. Additionally, the ventilation requirements for car tunnels are MASSIVE and would make the project insanely more expensive. Why do tolled tunnels ALWAYS go bankrupt? Let’s say you get 1200 cars per hour per lane for six hours a day each direction (this is the maximum number of cars per hour at 65 mph, three hours of rush hour in the morning and evening), assuming four lanes total, that is 4800 tolls per hour or 28,000 tolls per day. 140,000 tolls per week (5 day week). and 7,280,000 tolls per year. AT $15 per toll that is $109,200,000 in revenue per year. So it takes 10 years of 14,000 people willing to pay $150 per week in tolls to recoup 1 billion dollars in investment. Since the tunnel is going to cost many billions more, and building a tunnel capable of venting car emissions is insanely more expensive than building a tunnel for HRT or LRT, you are guaranteeing that any car based tunnel is doomed to failure from the start and quickly go bankrupt. So can we build HRT from the Orange Line to LAX as a westside rail backbone? No, not if it is built like the Purple line. Because Stations cost $500,000,000 each to excavate, and excavation of stations takes years and years and years, If you started the EIR today, and started simultaneous station box construction in 2021, you could not even start tunneling until 2024 at the earlierst. Given that the purple line TBMS have a maximum speed of 15 meters per day, you’re looking at 2000 DAYS of tunneling to traverse that distance. Six years. So obviously you have to do it in a process the reverse of the transcontinental railroad. Tunnel from Wilshire/Westwood north to the orange line and simultaneously tunnel South from wilshire westwood to LAX. Now you only need 1000 days of tunneling. you need at least six months of testing (and ideally six months of real world service to work out kinks) for any rail system before it goes online, so everything for the olympics needs to be completed in SUMMER of 2027 to be ready for summer 2028 commercial service. It is impossible to build a traditional HRT from the Orange Line to LAX if we build it like the purple line. So don’t. Build it like Barcelona. Line 9. That is to say: Do not build station boxes! build a bigger tunnel and put the stations in the tunnel. Then at the station locations, you simply bore elevator and escalator shafts into the tunnel stations. the inner tunnel is 11.6 Meters in diameter, two levels to the tunnel, NB on the top. SB on the bottom, Station platforms for both on the left hand side of the tunnel, tracks on the right side of the tunnel. Room on the left side of the tunnel for pocket tracks and other auxiliary tunnel needs. The first key is a supplemental EIR for the Purple Line phase 3, for the Wilshire / Westwood station. Build the station as two levels in the supplemental and allow room for launch pits north and south of the station for a tunneling machine. Then just start boring tunnels north and south in 2021 (presuming the EIR is finished by then). It’s 16 KM north to the orange line, and 14KM south to LAX, both should be done tunneling by 2024, interior tunnel construction done by 2025, stations done by 2026-2027. You could even have the north bound TBM continue north to build the Van Nuys line. Future infill stations are possible as well. Stations at Sepulveda / Santa Monica, Sepulveda / Expo, Sepulveda / Washington Pl (also serves Washington, Venice and Culver as all three streets are so close), East Fox Hills mall at Slauson (access to all the office towers north of the mall and we will have to go east around the cemetary anyway, so east of sepulveda slauson is far superior), terminating at LAX at the 96th street station. 9 stations total, 8 stations built within the single tunnel. HRT. Future Infill stations possible. it would cost 4.5 billion to build station boxes for 9 stations, and it would take years. It’s going to cost much less to build the station platforms within the tunnel, 50-100 million, so around $800,000,000 worst case scenario total for the 8 stations in the tunnel. what’s more, how about a future PPP with Kroenke to not have the line terminateat 96th street, but to have it turn, tunnel east down Century blvd and terminate at the new stadium? It would be a good place to build an extraction pit (or a launch pit if you wanted to go thte other direction) as well, that construction site. I am confused about the connection between NoHo and Pasadena. What’s the difference between what’s proposed and what’s already there (501). Is the idea to extend the Orange Line? Because that sounds ideal. So, again, nothing in the NE San Fernando Valley. We’re paying for Measure M, too, you know. It appears that there is still no North-South subway from LAX through West Los Angeles and continuing through the Sepulveda Pass and then through the San Fernando Valley. Se we are still required to take our cars to go North-South in that area, and especially to LAX. What a shame. Maybe the 22nd Century. Many improvements need to be made to Metrolink a true usefull 24/7 transit network. Needs all double track, even triple track in some spots. More equipment, better management. Amtrak Surfliner service needs more multi tracks AND an increase of equipment. Gold Line to Ontario Airport, could sure help folks to avoid LAX. East la to Long beach is so slow, as mentioned earlier, as well as the orange bus line from North hollywood to chatsworth. Traffic is still in the way. Will any improvement be made to these to improve speed? There should be rail to the West Valley and long before other projects. The Valley keeps getting neglected. In the short-term, there is a Measure M project to speed up the Orange Line. More details about that soon. The valley can blame the 90s politicians if they don’t like the Orange bus line. The Red line would most likely have been extended (underground or raised) along the Orange path if the restrictions on rail weren’t put in place. And yes, rail on the Westside (Purple, Crenshaw North, Sepulveda) would serve a far higher number of residents and businesses than any West Valley project. When will Metro file for the funds? 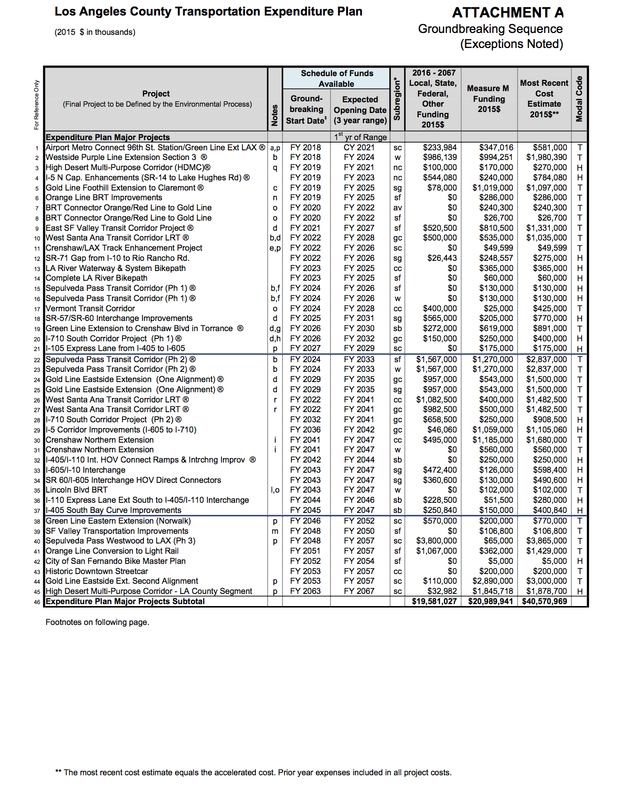 What projects will Metro request the fund for. I’m sure the Purple line to Westwood is first on the list. Will there be other projects that can benefit from this fund? Los Angeles 2028 Summer Olympic and Paralympic Games!